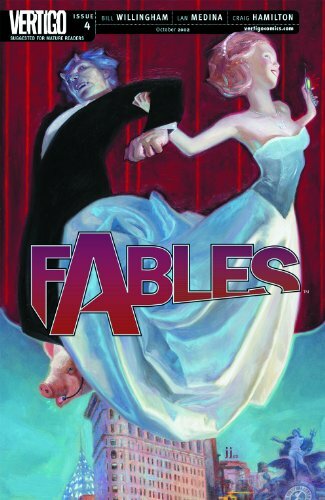 Bargain Alert: Fables Graphic Novel 99 Cent Sale! 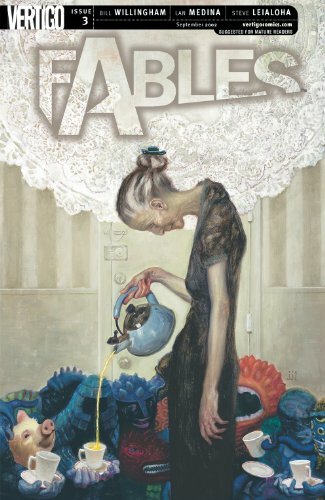 Fans of Gregory Maguire’s Wicked series of novels, or Frank Beddor’s The Looking Glass Wars series, or anything else that provides an adult-oriented, revisionist take on fairy tale characters and worlds, owe it to themselves to check out the Fables series of graphic novels—even if they’ve never read a graphic novel before. 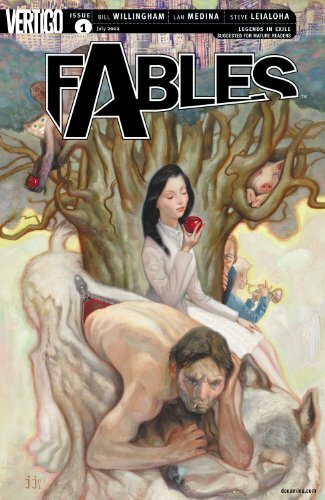 And right now, the entire series, all 212 books, are on sale for just 99 cents each in Amazon’s Fables 99 Cent Sale for a limited time! Amazon’s not saying when the sale will end, so if you’re interested in giving this series a try, act quickly! In these books, the fairy tale characters we grew to know and love as children are real, and living variously in hiding or in exile. This gritty, noir-ish, award-winning series abounds with murder, mystery, intrigue, politics (Goldilocks as a militant animal rights activist!) and mayhem, all with a touch of the supernatural. While they’ve only recently become available as individual books in digital format and therefore don’t have any reviews, the compiled anthologies of the books in this series are all rated 4/5 stars or higher. But this is no fairy tale, and when Snow White’s estranged sister, Rose Red, goes missing—her apartment a grisly, bloody scene—it’s up to her sister and Mr. Wolf to find the culprit. But the question remains, will they find Rose alive and intact, or will the cryptic message on her wall come true: “No More Happily Ever After”? Bigby Wolf, Fabletown’s one-man police force, interrogates some shady suspects for Rose Red’s probable murder—including Bluebeard, a known ladykiller…literally. Snow White reveals the salacious act that destroyed not only her marriage but her relationship with her sister. And penniless philanderer Prince Charming decides to sell his royal title over the internet. The mystery of Rose Red’s murder unfolds at a feverish pace. Bigby Wolf grills the Black Forest Witch, who may have returned to her old eating habits. Snow White consults her boss, Fabletown’s Mayor King Cole, who reveals his secret knowledge of Rose’s love life. Boy Blue and Flycatcher spill far too much blood. And jailed suspect Jack, of “and the beanstalk” fame, receives two surprise visitors behind bars: an angry, knife-wielding stranger and Bigby, who’s forced to reveal his true wolfish nature. Bigby Wolf’s investigation into Rose’s murder reaches its climax at the Remembrance Day Ball, an annual event that commemorates and revisits the secret history of Fabletown. But who would invite a psycho-killer to the most prestigious social event of the year? 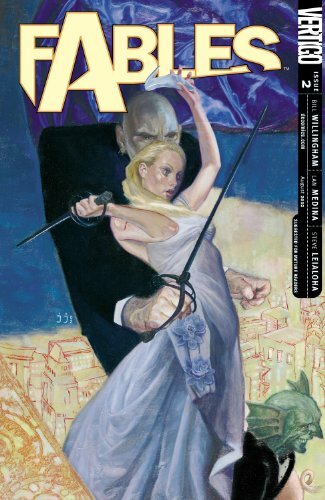 Plus, Bigby dusts off his twenty-year-old tuxedo, grabs a partner and hits the dance floor—with disastrous results. Rose Red’s body has been found, and the identity of her murderer has been revealed. Now Bigby Wolf, Fabletown’s sheriff, shows us how he put the clues together to solve the foul crime. Also, Prince Charming has auctioned off his royal titles and gets his first taste of his life to come…as a penniless nobody. 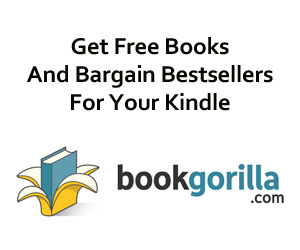 Click here to browse the full Fables 99 Cent Sale.